Did you know you could cook a pizza on the grill? I thought you had to have one of those fancy fire ovens in your kitchen or outside of your home for a grilled pizza. I was wrong. You can actually use a charcoal or gas grill. You don't even need a pizza stone. 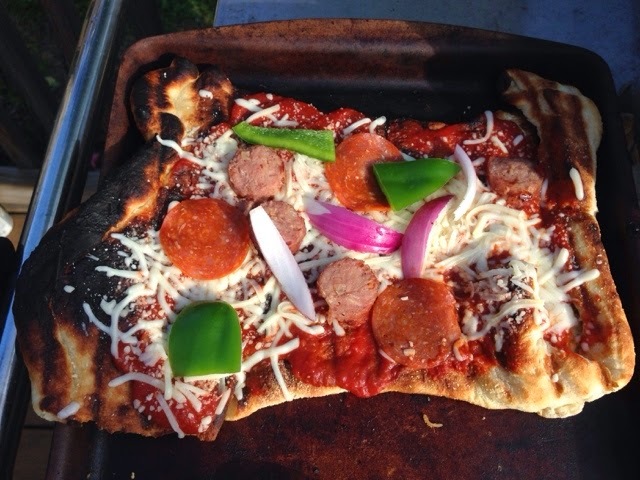 Since my family loves pizza and grilling on the grill, we decided to combine the both. Gilling pizza takes no time. I think the prep work takes the longest of all. Sauce - you can make you own. I used a organic pizza sauce in a can. I forgot the name. To start off, pre heat your grill on low heat. While the grill is preheating cook your toppings to the perfection you would like. Please note the toppings will not be on the pizza long enough to be cooked. I learned this the hard way on the first round of pizzas. While your toppings are cooking, roll out your pizza dough. Don't make your dough to thin. I cut my dough in half. I wanted to make smaller pizzas. I did my unrolling on foil. 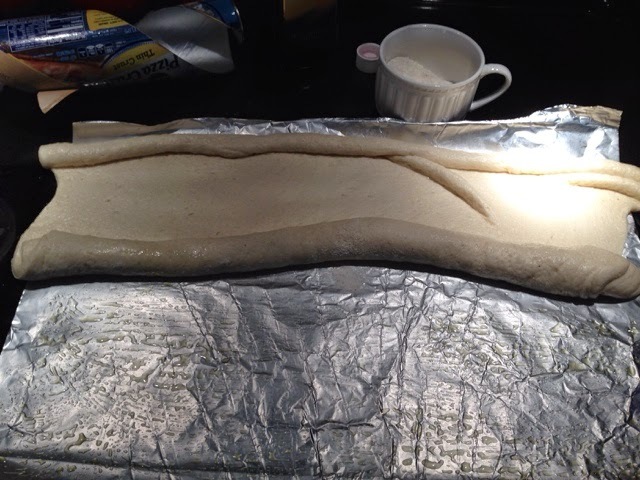 The top part of the dough brush with olive oil and sprinkle lightly with cornmeal. Leave the dough on the foil. Before placing the dough on the grill, rub your grill grates with olive oil. This will prevent your dough from sticking. To place the dough on the grill, take the dough on the foil and flip where the foil is on top leaving the dough on the grill grates. 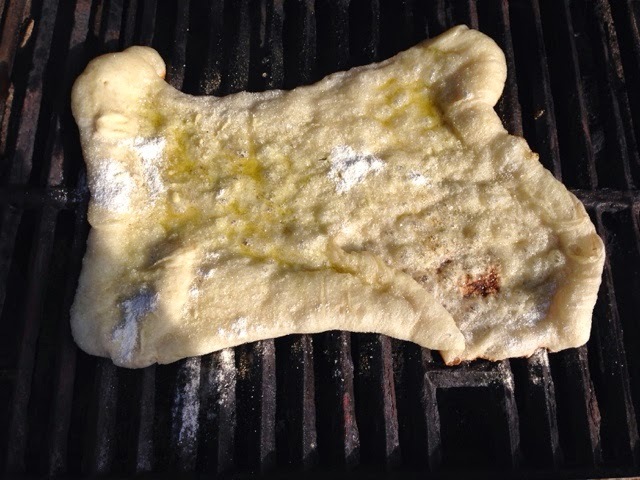 While the dough is on the grill grates brush the top side with olive oil. When the dough gets all bubbly it is time to flip. Grab a pair of tongs and flip. Once flipped, quickly place sauce, cheese and topping on the pizza. Let the pizza cook until done. Watch out, I burnt my first pizza, but it still tasted good. This was my second one and it turned out really good. 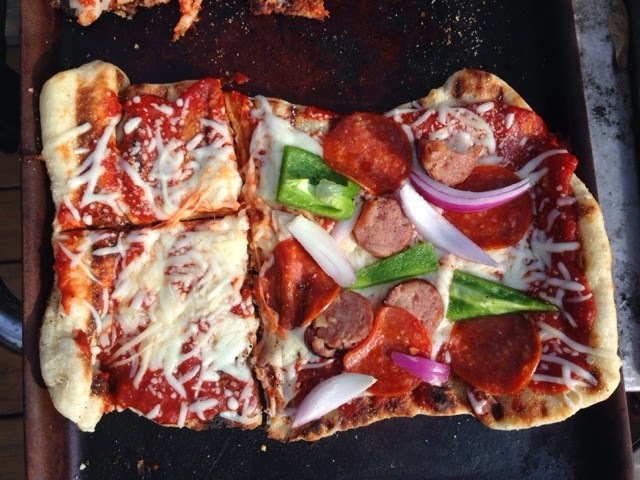 Do you cook pizzas on the grill? If you do, how do you cook them? I would love to know how your experience goes. If you have a grill recipe and would love to share it I would love to have you as a guest blogger. Just let me know and I will set you up a date.